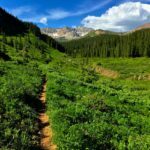 This loop probably packs more singletrack than any other mountain bike loop in Crested Butte, CO and it features terrain that you can only get in CB. 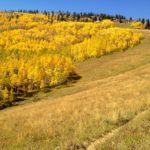 In a nutshell the ride starts in the Brush Creek drainage, goes over to the Cement Creek Drainage, then up the Cement Creek drainage all the way to the top where the Brush Creek and Cement Creek drainages are split by Starr Pass, and then all the way down the Brush Creek Drainage. Along the way you’ll ride all of the very best singletrack that has either recently been made from scratch (e.g. Point Lookout in 2013) or has been extensively remodelled during 2011-2013 (e.g. 409, Waterfall Cuttoff, Upper Cement Creek). Try it and you’ll be reriding it in your dreams for years to come. 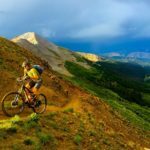 You have no idea how hard the Crested Butte Mountain Bike Association and its volunteers have worked on making this loop possible. Do yourself a favor and accept their blessing by making it a goal to ride this loop someday. Weather is a factor and do not underestimate how hard this loop will be. Strand Hill Road, Farris Road, 409, Pt. Lookout, 405, 405.2a, Waterfall Cutoff, Upper Cement Creek Trail, Cement Creek Rd, Crystal Peak Trail (#583), Star Pass, 400, Death Pass, Brush Creek Road. It’s a RIDE!!! !